Wrinkles are one of the many byproducts of the advancing years. And while we may want to celebrate the wisdom that comes with age, most of us aren’t so excited about the wrinkles! Let’s look at why wrinkles happen, what we can do about them and how to slow their arrival. Wrinkles come in two basic categories. Deep furrows are caused by muscular contractions. This category includes laugh lines and worry lines from habitually using certain facial muscles. These are sometimes called dynamic wrinkles. Environmental and genetic factors cause the second category of wrinkles, fine surface lines, also known as static wrinkles. The sun is one of the biggest environmental culprits. Ultraviolet light dramatically ages skin. Your habitually exposed parts -- such as face, neck, arms and backs of hands-- are more prone to damage than body parts that are usually covered. Smoking also increases the number of wrinkles. Research suggests that smoking releases an enzyme that breaks down elastin and collagen, which results in the thinning and wrinkling of skin. Loss of subcutaneous fat leads to wrinkles. If you bemoan carrying a few extra pounds, look at the bright side: Your skin is less prone to wrinkling than that of your thinner friends and acquaintances. The most effective type of treatment depends on whether your wrinkles are static or dynamic, and the age and condition of your skin. While some people opt for visiting plastic surgeons and dermatologists, your well-trained esthetician can help minimize the appearance of wrinkles with much less invasive beauty treatments. There is a facial option for almost any purpose and every skin type. Favorites in the anti-aging arsenal include a rejuvenating collagen facial that reduces visible signs of aging; a Vitamin A/peptide combo that promises an effect similar to Botox; and a facial that incorporates plant-based stem cell therapy for more youthful skin. Chemical peels are usually done on the face. They remove your skin’s top layers to reveal smoother, more attractive skin underneath. This procedure is also called chemexfoliation or dema peeling. In addition to minimizing the appearance of wrinkles, peels can improve rough patches, acne scars, liver spots, irregular skin pigmentation and scars. There are a range of chemical peels, from mild to moderately aggressive, depending on your skin’s condition and needs. This treatment involves a handheld machine that contains aluminum or silica crystals that act as a substrate that sands the top layer of skin. After a few sessions, you’ll notice smoother-feeling skin. This is a gentler form of dermabrasion, which requires a physician and anesthesia. 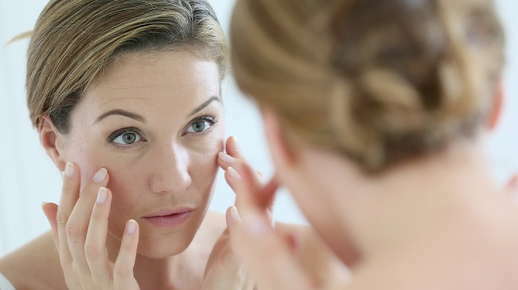 So what can you do to prevent future wrinkles? Fortunately, quite a lot. Your first plan of action involves basic skin care. Use cleansing products formulated for your skin type. And no matter how tired you are, gently wash your face before going to bed and apply an appropriate moisturizer. If you’re still in your twenties and are moisturizing, good for you! But use a lightweight product – you’re not old enough to break out the big guns yet. Monthly facials are a good idea at any age. Consult your esthetician about which kind of facial will be most beneficial for your skin type and maturity level. As noted above, it’s crucial for skin health to use sun protection and refrain from smoking. A note about sunscreen: You need to really slather it on to get the full benefit. Water is also essential for healthy skin – drink lots. Antioxidant-rich foods, such as berries, green vegetables, salmon, dark chocolate and avocados are all skin food. Don’t be too vain to wear your glasses. Squinting leads to dynamic wrinkles through habitual muscle contraction. Wearing sunglasses both prevents squinting and protects vulnerable skin around your eyes from sun damage. When you’re ready for a facial or other anti-aging treatment, give us a call. Nothing makes us happier than helping our clients feel beautiful.